Sometimes the universe sends you little messages. It’s up to us to listen. When we don’t, drastic measures may be initiated, like taking down your camera. Oh yeah people. It happened. 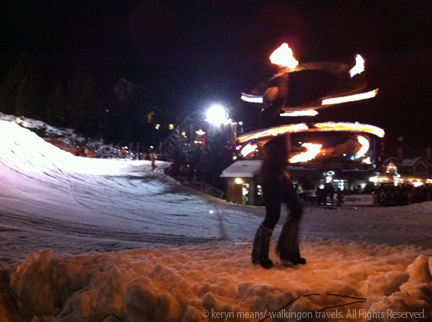 On Sunday night we headed to the Whistler Blackcomb Fire and Ice Show in Skiers Plaza. I had my point and shoot all ready to go. 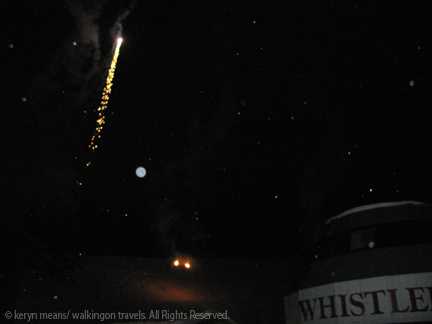 I didn’t want to drag my DSLR and tripod out for the show. We were having dinner afterwards and had been playing in the snow. The tiny camera was just more convenient. I had been a shutterbug our whole trip. 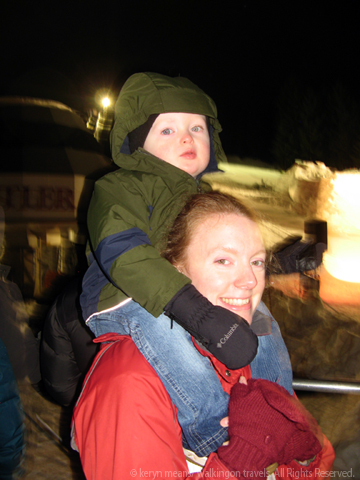 Pictures of Dek doing new things, the snow on quiet tree-filled lanes and all the delicious food we were eating. I had batteries in every conceivable place. That wasn’t a baby belly under my jacket; it was pockets full of batteries. When we got to the show, which features many of the ski and snowboard school instructors doing some pretty wicked tricks, I was ready to go. 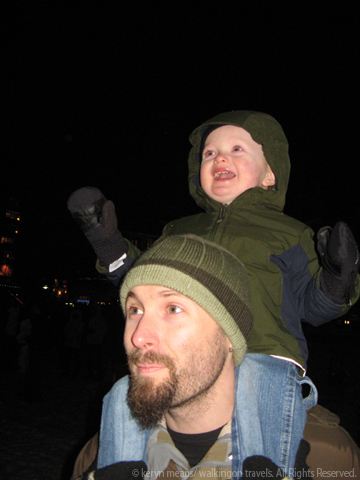 I found a spot up front so Dek could see all of the action. 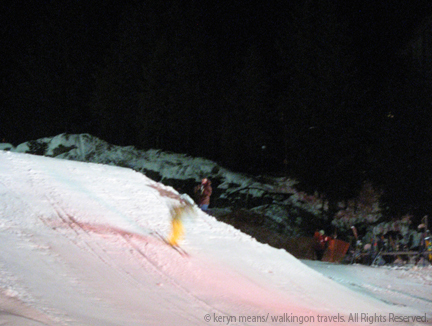 He yipped with glee as the first skier flew through the air and landed in the snow during a practice run. His favorite part was when the jumpers fell down. The performance took a little longer to get ready than we had anticipated. I snapped a few photos to get my settings perfect. My low battery warning started to flash. I wasn’t worried. I could make it through the show. The fire dancers got ready right next to where we were standing. 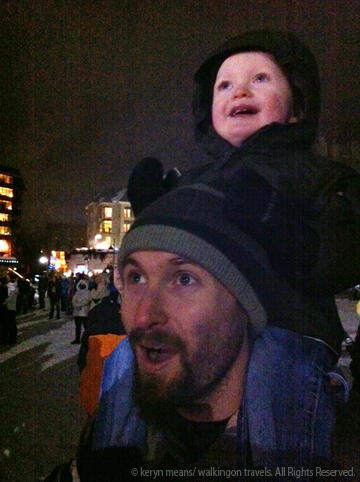 We would have a great view of their performance while the snowboarders did their tricks in the background. I went to snap a picture as the first dancer lit her batons. My camera died. It just shut itself down. I reached in my pocket for another battery. Nothing. I went through my bag to see if any were in there. Nope. Just dead batteries. At some point in the day I had emptied out my pockets to lighten my load. What was I thinking!? I gave up on my point and shoot with disgust and pulled out my iPhone. It wasn’t the best alternative, but it would at least give me a few shots of the dancers and Dek. Fire dancer with hula-hoops lit on fire? Yes please! Hula-hoops lit on fire were the perfect distraction to my camera failing. No matter how old you are, it is pretty darn cool to watch. 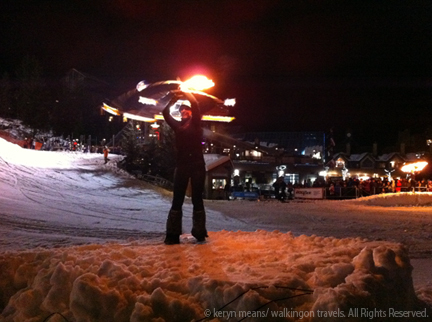 Seeing Dek’s face light up when a snowboarding did a 360 through a ring of fire, now that was priceless. No camera could have captured that moment as perfectly as my mama memory. I stopped, I watched, I shot a few photos in a halfhearted manner, but above all, I just enjoyed being in the moment with my family. Sometimes it’s hard to remember that I’m part of the fun too when I’m trying to capture every precious memory on film. It’s nice that the universe reminded me to stop and smell the roses, or in this case, the fire and ice. Capture the fun but don’t forget to enjoy it yourself. Memories are sometimes better in your head than on film. 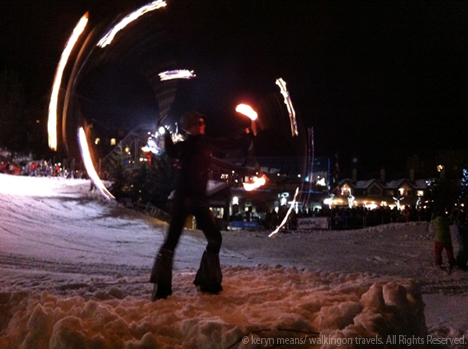 Fire and Ice Show, located in Skiers Plaza: Whistler Village. Just follow the crowds headed that way. There are plenty of restaurants along the way to stop in for an early bite to eat or grab something on your way back to your hotel or condo. That happened to me, sort of, when I was in Prague. I ran out of batteries and walked around the city actually seeing the city. And what a gorgeous city. Of course, I was plagued by the thought every now and then: “Oh, I wish I could get a shot of that!” But it was a new kind of travel that day, without my man-made lens and only my two god-given ones. (Oh and the ones in my glasses) Anyway, it felt sort of freeing. And then I went back to a few special places the next day with batteries! 🙂 Sounds like a great trip. Wise words from a wonderful daughter. Good advice – it’s great to have photo memories but the family photographer misses a lot of the action when they are behind the camera all of the time.